Everyone knows that Las Vegas is hot in the summer – but people who live here year ’round know that the winters can be downright cold. In fact, the average high temperature in Las Vegas during January is 58°…and the low is just 39 degrees! 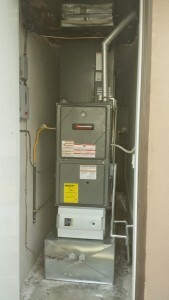 So, a properly installed and maintained furnace is more than a luxury, it’s a necessity. Call the HVAC experts at Sahara Air Conditioning and Heating when you’re looking to purchase a new furnace for your home or business, or need maintenance or repair on your existing heating unit. How do I know when I need a new furnace? Is your existing heating system over 15 years old? Is it getting more costly each year to maintain your furnace? Have you noticed a spike in your utility bills? Are some rooms in your house colder than others, not matter how high your set the thermostat? Is the cost of maintenance getting out of hand? If you answered “yes” to several of these questions, it may be time to talk to one of our HVAC experts about replacing your old furnace. There are a lot of things to consider before you purchase a new furnace for your home or office. What type of system do you need? What’s the fuel source, gas or electric? How efficient do you want your new system to be? Is indoor air quality a concern? What’s the warranty, and are there any rebates? What’s the proper AFUE rating? The AFUE (Annual Fuel Utilization Efficiency) tells you how efficiently your furnace uses fuel. The higher the efficiency, the lower the monthly operating costs for heating and you’ll see the cost of your unit paid back in a few short years in the form of lower utility bills. Talk to our heating experts and see how easy it can be for you to start enjoying heated comfort at an affordable price. Something else to consider is how efficient your home currently is. If your air duct system is old and leaky, even the most efficient, modern furnace isn’t going to effectively heat your home. Sahara Air Conditioning & Heating provides our clients with free estimates and 24-hour emergency heating service. We always honor our commitments because we value you as a customer. Our professional heating contractors can design and install any type of heating system for your home or business. We also provide you with a cost & benefit comparison analysis of each HVAC manufacturer, so you can make the most informed decisions about which systems best suit your needs. With a new high efficiency air conditioning and heating system in you can save up to 20%-70% on your utility bill.